How can we make compassion a clear, luminous and dynamic force in our polarized world? According to the panel of presenters speaking at Peninsula College’s February 7 Studium Generale presentation, it takes a principled determination to transcend selfishness, and compassion to break down political, dogmatic, ideological and religious boundaries. The panel, comprised of contributors from across the community, will focus on ways we can use the power of compassion to understand, lead, influence and create better outcomes in healthcare, education, business, social service, and community wellbeing. 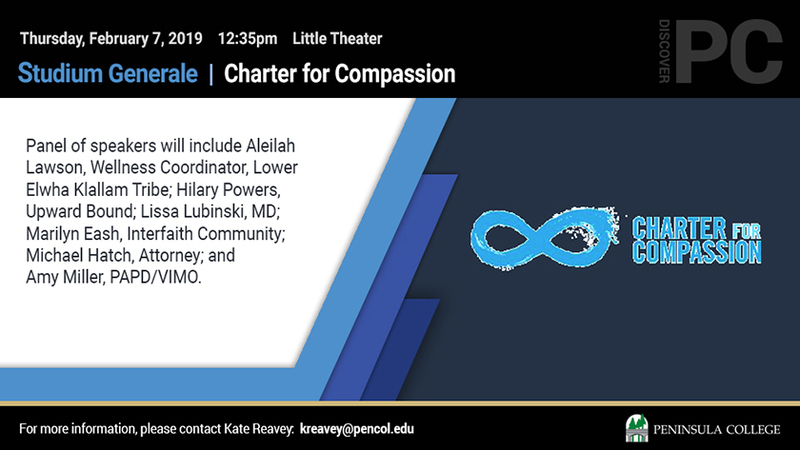 Learn how we can use the guiding principles of the Charter for Compassion and its deep international network to organize compassionate action in our community, combining individual actions and local groups, at the 12:30 pm presentation in the Little Theater. The principle of compassion, calling us always to treat all others as we wish to be treated ourselves, is at the heart of all religious, ethical and spiritual traditions the group says. Rooted in our deep interdependence, compassion is essential to human relationships and to a fulfilled humanity. For more information, contact Dr. Janet Lucas at jlucas@pencol.edu .